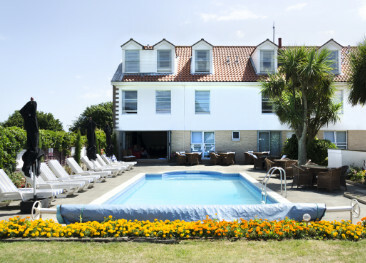 The Beausite Hotel is a well-loved and relaxing hotel on Jersey's east coast, close to the Royal Jersey Golf Course, the picturesque Gorey harbour and Grouville Bay beach. Traditional at heart, the Beausite has been designed around an old granite farmhouse respecting the original features without compromising on modern comfort. The Beausite’s staff are always happy to help you organise your stay and many visitors enjoy returning year after year. Holidays for the Beausite Hotel for 2019 are currently only available to book by phone. Please call us on 01534 496 650 for assistance. The Beausite offers a choice of double, triples and family rooms. All guest rooms are en-suite and equipped with tea & coffee facilities, TV & radio, hairdryer and direct dial telephone. There is 24 hour room service. The 1636 Cocktail Bar is perfect for enjoying drinks before dinner. The hotel's restaurant opens for breakfast and serves a set menu for dinner. The Beausite offers a lovely indoor swimming pool, a fitness room, two Saunas, a spa bath and shower. The hotel has easy disabled access and 18 of the rooms are on the ground floor room but none are disabled rooms as such. The Beausite is located in a residential rural area close to Jersey’s east coast and away from the hustle and bustle of town and traffic. The hotel sits pretty much half way between St. Helier and the delightful harbour village of Gorey. Dogs are accepted on a request basis, subject to size, at a charge of £10 per day. Dogs are not permitted in the lounge or restaurant. The staff is very friendly and helpful. The accommodation was clean and comfortable and the food excellent. The swimming pool is an added bonus. Good setting, friendly staff, comfortable hotel. 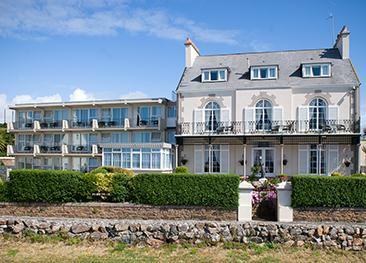 We had a very pleasant stay at the Beausite Hotel, Grouville Bay. Great Location, all the facilities we needed, but the icing on the cake was the service we received. All the staff were friendly and eager to help. Nothing was too much trouble. They deserved five stars for everything, helpfulness, super clean, lovely food and a very relaxing atmosphere. All in all a brilliant hotel and would love to stay again, perfect location too. Unfortunately our room had not been cleaned on our arrival in the afternoon but this was quickly rectified. Apart from this initial hiccup the rest of our stay was faultless. The hotel was very clean, rooms were done daily, the décor looked recently updated. 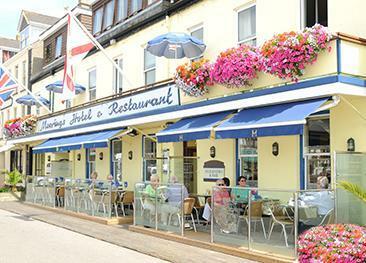 The Moorings is a small and friendly hotel perfect to enjoy a few days unwinding. In its own words, this is the place to “drop anchor” and adopt Jersey’s peaceful way of life.